Back to reality. It's time to wake up from your ongoing holiday food coma and brush off the dust from your Twitter account as it's time for another GOP debate Thursday, Jan. 14. 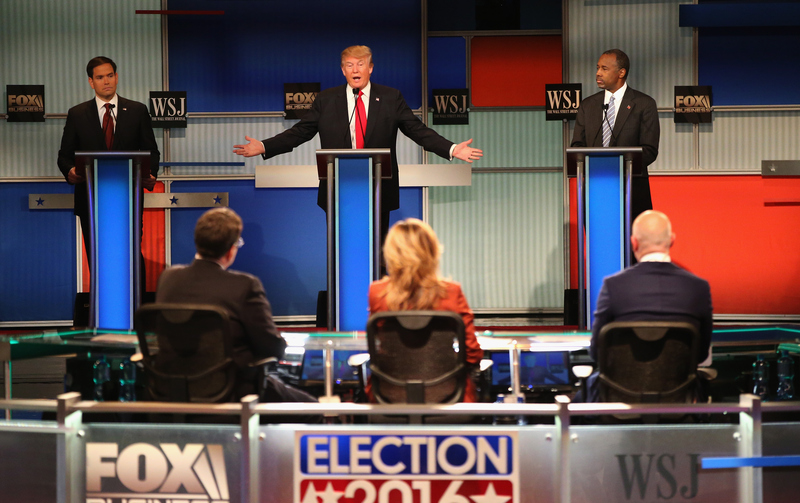 The debate, and an earlier undercard debate will air once again on Fox Business Network. The main debate will air at 9 p.m. ET with the second-tier candidates starting the night early at 6 p.m. ET. All pretty straightforward except for one thing: What's Fox Business Network? If you're not familiar, no worries, because there are other ways to watch the sixth GOP debate without cable or the channel isn't carried by your provider. Update: Fox Business announced on Monday that COX, Suddenlink, and Mediacom will unbundle Fox Business Network on Jan. 14. The debate will be available to stream for free for everybody on FoxBusiness.com. Although the easiest route would be to stream the debate over the Internet, Fox Business Network has not yet announced whether or not the debate will be streamed online. However, during Fox Business Network's GOP debate in November, you were able to tune in online without a cable subscription log-in, so hopefully if the past is any indication, their site might be streaming the debate come Thursday. Other options including going to a local bar with a penchant for political debates or finding a house party. If you want to brave it, you could consider attending a candidate-sponsored watch party, but I highly recommend mining your own network of contacts for your own mental health. Fox Business Network has tapped two of the same moderators from November for the debate. Two of the channel's anchors Neil Cavuto and Maria Bartiromo will be keeping the candidates on task. Cavuto is the network's editor of business news and Bartiromo is the global markets editor. The Wall Street Journal 's Gerard Baker, who was the third moderator in November, will not be co-moderating this time. The trio received decent reviews after the November debate. The New York Times' James Poniewozik said the moderators avoided becoming the story themselves but also didn't do much moderating. Good questions often went unanswered, with candidates delivering parts of their stump speeches. Also repeating their roles in the undercard will be Trish Regan and Sandra Smith. Regan and Smith are both reporters for the network who host or co-host their own shows, The Intelligence Report and Outnumbered respectively. The candidates who participate will be chosen based on national and state polls leading up to Monday, Jan. 11. Those invited to attend will be announced on Lou Dobbs Tonight that Monday evening on Fox Business at 7 p.m. ET. The candidates must place in the top six nationally or in the top five in either Iowa or New Hampshire. That could limit the main-stage debate to just six players. So find some friends and mix yourself a drink. If Trump gets 1/6 of the air time, you'll want one.